Make the reliable family favourite healthier with this recipe, which uses ground almonds for coating. Whisk the egg and milk together in a shallow bowl. Combine the ground almonds, paprika and seasoning in a second shallow bowl. Dip a chicken strip into the egg mixture, shaking off any excess, then transfer to the ground almonds and coat generously. Set aside and repeat for the remaining strips. Heat a little coconut oil in a frying pan set over a high heat. Add the chicken strips and fry for 2 to 3 minutes on each side, then turn the heat down to medium and continue to cook for about 10 minutes, turning regularly, until the chicken is cooked through. 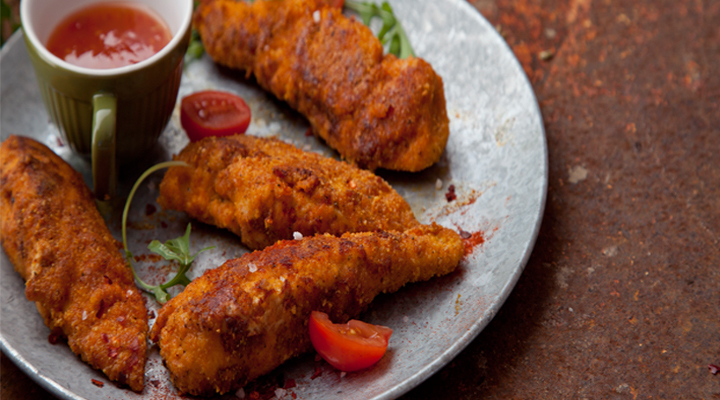 Serve with a green salad and a small bowl of sweet chilli sauce on the side for dipping.